There are times when you want to optimize your Solr index. 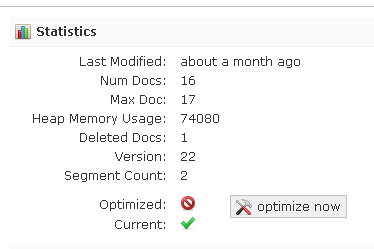 But what is optimize and why do I care? Optimize is similar to when you defragment your hard drive. Solr will create a new index removing any deleted documents. It is simply house keeping at its best. I usually do a commit from the Admin UI, going to the overview tab. Notice how the # is removed from all REST calls vs when the Admin UI loads.